Apple's new iPod Touch appears to have been a huge hit this holiday season with evidence that the high end iPod has seen massive gains in marketshare. The first impact was seen in early sales numbers for App Store applications on Christmas day. The #1 ranked App Store application (iFart Mobile) saw a tripling of sales from 13,000 units a day to almost 39,000 units on Christmas day. This growth in sales, however, was not just isolated to the #1 spot and was seen across the entire App Store. Several game developers on TouchArcade.com reported sales boosts of 3x-4x across all titles, even for titles not in the top 100 listings. 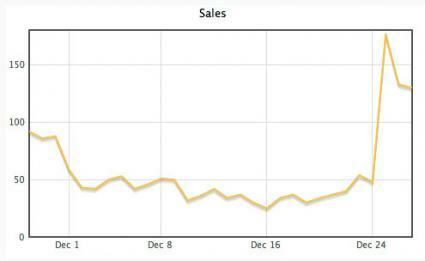 Hit Tennis [App Store] developer Mark Johnson reported a 4x sales increase on Christmas for his tennis game and provides this striking graph (above). The graph shows real time browser marketshare data for the iPod Touch which showed a massive spike on Christmas day. While there is a slight increase in the iPhone graph as well, the majority of the Christmas growth appears to be with the iPod Touch. This trend, of course, reflects the difficulties in gifting an iPhone vs an iPod touch. Net Application generates browser marketshare data based on 160 million visitors from their data pool. Apple has been marketing the iPod Touch as more than just an MP3 player with a specific focus on gaming. If these trends are true, then some of the boost in App Store downloads should be sustained as it reflects actual marketshare growth rather than just increased spending surrounding the holidays.